So, you know those funny words you have to try and read when you fill out an online form? That is called a captcha and they were designed to help combat Spam robots (called bots) that go around the internet and fill out forms much to the dismay of the website owner. So to make you identify that you are a human, they came up with these forms. Now some of these little letter pictures are helping save books. 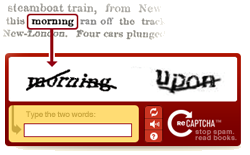 Watch the video below about ReCaptcha. I bet you will never look at these annoying forms quite the same again.